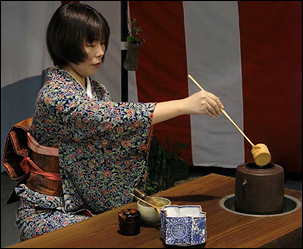 Since the time of Japan's most famous tea master, Sen Rikyu (1522-1591), raku ware has been the favored teaware of wabi-cha - the rustic, Zen-influenced tea ceremony of Japan. Raku pottery is rapidly fired and then removed from the kiln while still glowing hot to cool. 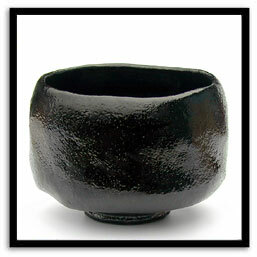 The result is the unique glossy black tea bowl that has been at the center of chanoyu for centuries. PLEASE NOTE: Each raku bowl is made by hand (not made in a mold or turned on a wheel) and is an individual work of art. Presented in wooden box with papers. Originally inspired by Korean pottery, Japanese Hagi ware is made of rustic, pinkish-red clay and glazed milky white. 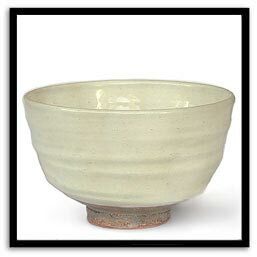 Our imported Hagi-style tea bowl is hand-thrown on a potters wheel - its rough clay body contrasting with its smooth, white glaze. Presented in decorative cardboard box.